The T-34-85 is a Rank IV Soviet medium tank with a battle rating of 5.7 (AB/RB/SB). It was introduced in during the Closed Beta Test for Ground Forces before Update 1.41. Though similar to the T-34-85 (D-5T), it has an improved gun and a full crew for combat efficiency. The T-34-85 is an improvement over its predecessor, the T-34-85 (D-5T) with a better armament, ammo, and an additional crew member. Aside from that, the two's technical specification are pretty much the same. 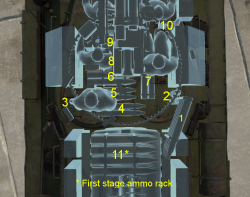 The front hull armour is only 45 mm thick, even when sloped this is a pitiful amount of armour to fight with against the other BR 5.3 vehicles as every other tank gun can penetrate that armour. Thus if possible, do not prolong the exposure of the hull armour towards the enemy. The gun mantlet has 90 mm in front with additional small and thin 40 mm plates on the sides of the gun. See here. Any enemy vehicle around the T-34-85's BR bracket can destroy it if it can get a solid shot on the hull armour. Beware when exposing hull when coming out to take a shot on an enemy, someone is bound to be watching for the T-34-85 and they won't be afraid to plant a shell into the 45 mm hull armour. Ammo racks of the T-34-85. The T-34-85's best play style is that of a flanker. 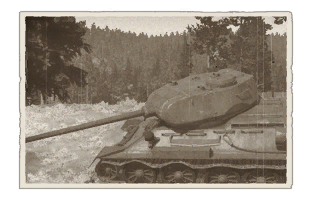 Due to its high mobility, fast turret traverse, and a capable cannon with excellent post-penetration damage, the T-34-85 fills this role perfectly. Since the turret is so tall, it makes combat behind low obstacles difficult, as the turret segment above the main gun is visible. The T-34-85's other playstyle can be as a support tank, by keeping up with more protected vehicles like the IS-2 and supplement firepower while their heavy armament reloads. The T-34-85 would not make a very suitable short-range brawler though even with the 85 mm gun as the gun has a rather tedious reload for the specific playstyle and the T-34's armour is very poor at its BR. With that, the T-34-85 would tend to be able to fire one shot at a close enemy before it gets taken out by other enemies nearby. However, it is understandable that the situation is unavoidable, so it is recommended to stay steady by firing one shot at an unsuspecting enemy at close range before retreating to reload, evading enemy shots. The T-34-85 can do well in many environments with its battle role, though it is recommended to stay away from large open areas as bigger guns like the Tiger's 88 mm can chew up the T-34-85 from a long-range. Thus, it is best to stay in cover and concealments, like fighting in the forests and urban areas. Using its mobility, attempt to flank enemy tanks to hit them before they realize where the T-34-85 is. Even if caught in a frontal engagement, the 85 mm gun can dish out enough penetration to get through weak points on most enemy tanks like the Tiger I's front hull plate and the Panther's gun mantlet. In these engagement, keep little hope in hull armour and hull angling, shoot first and evade, otherwise enemy tanks will be able to destroy the T-34-85 easily. Even if upgunned with the 85 mm gun with a much more protective turret, the T-34-85's hull armour is just as thick as it was on the 1942 variant. As such, the T-34-85 is very vulnerable to tanks BR 5.7 and higher since they have guns able to tear through the armour. As such, it is best to keep T-34-85 away from the front arc of beasts like the Panther, Tiger I, and IS-2 and try aiming for their much more vulnerable side armour. It is best for the T-34-85 to do so as the post-penetration damage of the 85 mm gun can do much more damage hitting through the side right into the middle of the hull than it is from the front. Against medium tanks like M4A3 Shermans, Panzer IVs, and other T-34-85s, it is safe to fight them frontally as long as the player T-34-85 gets the first, penetrating shot on the enemy tank, as the first tank to shoot and hit tends to be the winner. Excellent upward elevation on gun. Fast rate of fire (aprox. 7+ seconds with good crew). 85mm AP does respectable damage (semi-oneshot) upon penetration. Has APCR as an upgrade. Overall armour can bounce lower BR tanks quite reliably, and with a good MM, it clubs hard. Benefits from a designated loader in the crew, a first for the T-34 series, resulting in faster reload. 5 crew-members also means survivability is significantly increased. Armour is useless in Rank 4+ matches. Below average penetration with standard ammo. Poor angling on the turret(makes bouncing shots unlikely in most situations). High profile. Since the turret is so tall, it makes combat behind low obstacles difficult, as the turret segment above the main gun is visible. The T-34, in its introduction, was a huge shock to the German army when they invaded as they did not have the adequate anti-tank weaponry to defeat the T-34 and its heavier companion KV-1 tank. However, by 1943, the Germans began introducing newer tanks or upgrading their current tanks. They upgraded their Panzer IVs with the 75 mm KwK 40 gun, which could penetrate the T-34, and introduced the Tiger I and Panther tanks into their forces, which could not only destroy the T-34s easily, but can also take in the 76.2 mm shells the T-34 fires. The inferior firepower the T-34 forced the T-34 forces to close in to a very close distance during the Battle of Kursk with the Tigers and Panthers in order to get to the sides and fire at the weaker armour. While the Soviets were victorious against the German offensive, the T-34s suffered high losses with this strategy. The T-34's slow improvement from the 1941 model was due to the decision to keep changes to the model low to keep costs low and productivity high. This worked well in the first two years against the Germans, but the Battle of Kursk showed that the newer German tanks now outgun the T-34s. Soviet High Command, once conservative on the T-34's upgrades, now opted for an increase in the T-34 armament to be able to counter the German tanks. During the development, an interim solution for the problem was the equipping of the 57 mm ZiS-4M gun onto the T-34, which has better penetration capabilities compared to the 76.2 F-34 gun. This tank, the T-34-57, performed as an adequate "tank-hunter", but the small HE shell on the 57 mm gun made it a poor tank armament so this was only an interim solution until a better design is made. Testings with various of guns in Soviet inventory against captured German tanks showed that the most capable gun was the 85 mm 52-K anti-aircraft gun. With this discovery, the 52-K underwent development to make derivatives able to be mounted onto a tank. The cannon was able to penetrate the front of the Tiger from 500 meters out, the turret side from 600 meters away, and the hull side from 800 meters away. The 85 mm was first mounted onto the SU-85s, but the need for an upgraded tank had the Soviets find a way to fit the gun in the T-34. The cannon was much larger than the F-34 gun and so a much larger turret was necessary to house the gun. The solution to this was to transfer the turret from the cancelled T-43 tank program onto the T-34, this increased the turret ring diameter from the original 1,425 mm into 1,600 mm, which required a retooling in the manufacturing plants. While this delayed T-34 production, the 85 mm was finally able to be mounted onto the T-34 as the T-34-85. The T-34-85, aside from the enlarged turret ring for the new turret, uses the same T-34 hull design. Armour was still about 45 mm thick, sloped at 60 degrees for a 90 mm effective thickness. The Christie suspension was retained, as well as the diesel engine. However, the biggest difference in the tank design is the three-man turret, though a turret basket is still exempt from the design. Before, the two-man turret on the older T-34 had the commander forced to do his job and the gunner's, the three-man turret on the T-34-85 separated the commander's duty by having a separate gunner to fire the gun, leaving the commander to do his job commanding the tank as a whole. The larger turret also has space for a radio (previously in the hull by the assistant driver), allowing the commander to effectively communicate between tank units. Aside from the enlarged turret ring, new turret, and the 85 mm gun, the internal specifications of the T-34 and its pros and cons were nearly identical to the older variants. The 85 mm gun on the T-34-85 was able to penetrate 125 mm of armour at 500 meters away at a 90 degree meet angle with normal AP rounds. The 85 mm gun was derived from the 52-K anti-aircraft gun, which was developed from Vasilliy Grabin and Fyodor Petrov's design bureaus. Petrov's bureaus produced the 85 mm D-5T gun while Grabin's design, after being taken over by A. Savin, produced the 85 mm ZiS-53 gun. During trials in the Gorokhoviesky Proving Grounds, it was found that the ZiS-53 gun was much better than the D-5T and was much simpler, which was redesignated as the ZiS-S-53 after Savin's initials. 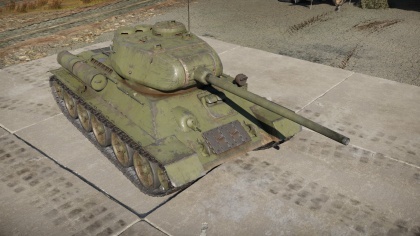 However, as the new turret was optimized with the D-5T gun, the T-34-85 started with the D-5T as the T-34-85 Model 1943, which ran on from February to March 1944. After March 1944, the 85 mm ZiS-5 were used as the armament of the T-34-85 Model 1944. During its production life from 1943 to 1958, up to 48,950 T-34-85s were created (22,559 of which during World War II), consisting of more than half of the total 84,070 T-34 units created in its entire production life since 1940. From its introduction in March 1944 and onwards, the T-34-85s were the main tank in Soviet service. The older T-34s were still being used in the theater as they are lost from combat and retribution and replaced. The T-34-85's 85 mm gun armour penetration and front turret armour nearly doubled compared to the older T-34, yet retain the same speed, mobility, and hull armour. The T-34-85 was vastly superior the German's Panzer IVs and StuG IIIs, and though it was still inferior against the Panther and the Tiger I, it had better chance than the older T-34 models. The T-34-85s maintain numerical superiority throughout the entire war due to the Soviet's industrial base and design concept of mass producing single designs, while the Germans focus on newer, better tanks such as the heavier Tiger II, which restricted productivity and made logistics a hard job to maintain. The T-34-85s were the main Soviet spearhead weapon during Operation Bagration and its future offensives up until the Battle of Berlin. After the fall of Nazi Germany, the Soviets use the T-34-85s again in their invasion of Manchuria to fulfill their promise to invade Japan after the fall of Germany. The combined-arms forces of their armoured units overran the Japanese positions in Manchuria and were pushed all the way to a distance from the Yalu River. The Japanese surrender order was given out by the emperor on August 14, which was not carried out as a cease fire until August 17. After the end of World War II, the T-34-85s were given out in massive quantities to Soviet occupied territories and their allies. The next action the T-34-85s faced was in the Korean War, in the hands of the North Koreans. The North Korean armoured forces are able to assault deep into South Korea with these tanks as South Koreans were severely under-equipped in anti-tank weaponry, only armed with US-supplied M24 Chaffees and regular bazookas, which were useless against the T-34s. It wasn't until the deployment of US troops into the Korean peninsula that the tide turned against the North Koreans and their tanks. The US sent their M4A3E8 Shermans, M26 Pershings, and "Super Bazookas" to arm the troops there. All these weapons are able to destroy the T-34-85s, with the M26 Pershing being able to penetrate straight through the front and back of the T-34-85 armour with HVAP rounds. The Shermans are nearly equal to the T-34-85s, but the better optic quality and crew training gave them an edge against the T-34-85s. These anti-tank weapons supplied by the coalition caused the North Koreans to suffer major tank losses and after their supply lines were cut by the US landings at Inchon, the armoured vehicles were abandoned as the North Koreans retreated. Pure tank-to-tank battles between the two sides were scarce after 1950 due to a heavy decline in armoured forces in the North Korean side. Past the Korean War, the T-34-85s were clearly obsolete with development of newer tanks being developed world wide. Despite that, many countries still use T-34-85s as their main tank or as reserves, even the Soviets and Finnish continue using them until the late 1960s. Warsaw Pact countries used them in large quantities and were involved in many conflicts within these countries, such as the East German uprising in June 1953, Hungarian revolution in 1956, Coup by Greek junta in July 1974, and the Turkish invasion in July-August 1974. The T-34-85s also saw conflicts in the Middle East in the hands of Syrians, Egyptians, Jordanians, and Iraq; Vietnam with the North Vietnamese, and in the Bosnian War in the Bosnian Serb Army. African countries such as Somalia and Angola still use T-34-85s in their armies, and they could even be seen in the recent conflicts in Yemen and in Ukraine. Despite their age, it seems that the T-34-85 was to become a tank that will persist in the hands of smaller countries for years to come. During late 1944, the Soviets were already searching for a successor to the T-34s that use most of the newest tank technology found in recent years. The result was the T-44 medium tank, which did not enter service in time to see widespread usage and even combat during World War II. The T-44 underwent further development and redesigning to become a tank that would surpass the T-34 in the most produced tank in existence, the T-54 tank.